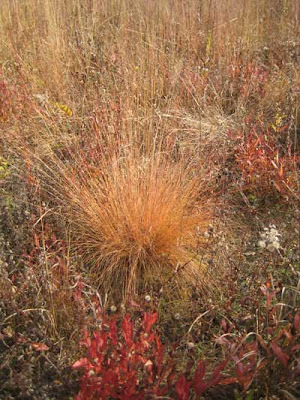 Prairie dropseed (Sporobolus heterolepis) is one of the prime conservative prairie grasses and is a good indicator of a high-quality site. It has a C value (coefficient of conservatism) of 10 (the max!). The best sites are dry to dry-mesic prairie remnants. 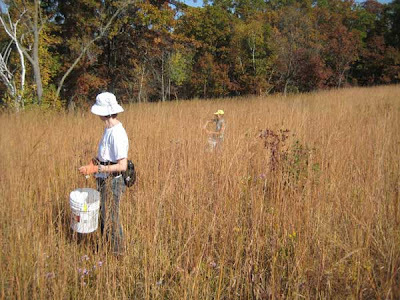 Now is a good time to survey such prairie remnants for this species, as its fall color and growth form are characteristic. At Pleasant Valley Conservancy we had several remnants where prairie dropseed was present. The best was Unit 1 (Kathie's Prairie), which has dozens of colonies. 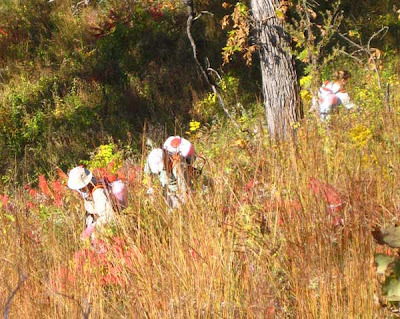 Unit 4 (Tom's Prairie) had two colonies and nearby in Unit 10 there was a single clump growing out of the dolomite. Finally, there were some small colonies growing out of the dolomite on the Rocky Overlook (Unit 6). It took quite a few years for dropseed to get well established at this site, but now it is really flourishing. Several days ago we collected smooth aster seeds here and I was struck by the great color of the dropseed. As the photo shows, the smooth aster is also quite colorful. Prairie dropseed isn't always this colorful. Yesterday I was helping collect seeds at Hagen Prairie and noticed that the dropseed was more of a plain brown color (although still growing in characteristic clumps). New higher resolution air photos have been available in Wisconsin for a few months but I just got around to accessing them. The whole state of Wisconsin was "flown" in early spring 2010, in so-called "leaf off" conditions, at relatively high resolution. These images are available free, and because they are in GeoTIFF format, you don't need GIS to look at them (although they load into GIS without any effort). These photos were taken by the Wisconsin Regional Orthophotography Consortium (WROC), which is a partnership with state and local governments. (The air photography was done by Ayres Associates and Aero-Metrics.) These photos are completely in the public domain, and can be downloaded free of charge from the WisconsinView.org web site. These air photos are at higher resolution than those created for agricultural purposes by the National Agriculture Imagery Program (NAIP). Although the NAIP photos, taken "leaf on", have advantages for ecological and restoration purposes, the WROC photos have some advantages since they permit much better view of cultural features (roads, trails, houses, parking lots, etc.). When I first looked at the photos of Pleasant Valley, I got a real surprise. A rather large "funny black area" was visible covering the south-facing slope and the Crane and Valley Prairies. 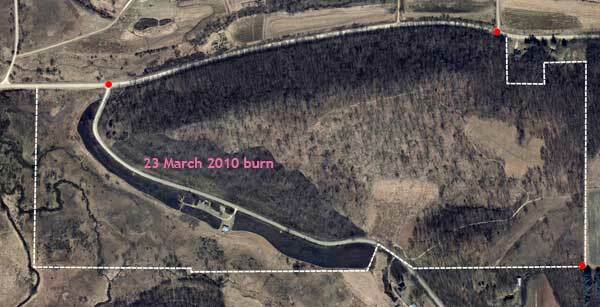 The interpretation is that our area was "flown" after our 23 March 2010 spring burn, but before our 29 March savanna burn. The black area where the burn took place really stood out. (The blacks of the north-facing woods areas are not caused by a burn, but simply by the dense forest.) Don't be fooled by the low resolution of the photo here. I had to greatly reduce the resolution and size of the photo for use on my web site. The original GeoTIFF photo is of very high resolution and can be viewed equally well by the standard Windows XP photo viewer or by any photo editing program. However, be warned that these are large photos. Each of the two photos is over 500 MB in size! To access these air photos, go to the WisconsinView.org web site and sign in. If you haven't accessed the site before you have to fill out a form, but there is no charge. Once signed in, go to the Aerial Photography page and then select WROC and Other Air Photos. Select your county and a map will come up overlaid with a grid that divides the county into Quarter Quads (based on the standard U.S.G.S. topographic quads). Once the selected photo is downloaded (it takes a bit of time), unzip it using the standard Windows Zip utility. You can use it either in GIS or with any photo editing software. Because Pleasant Valley Conservancy overlapped a NE and NW quad, I had to download two photos to cover the whole site. However, the two photos merged seamlessly in GIS. These new high resolution air photos are extremely valuable for restoration purposes. You'll be surprised at the things you will learn! After a big push, we have finished with sumac for the year, and have turned to buckthorn. This is a good time of year to attack buckthorn because most of the native vegetation has senesced and turned brown, but buckthorn retains most of its dark green leaves and can be easily detected. Since most of our buckthorn plants are small, they are really hard to spot during most of the growing season. Those following these posts know that buckthorn is a demon to eradicate. Although we have no large buckthorn plants left, new shoots keep coming up from dormant root masses. These root masses are widespread but remain invisible underground. Only when they send up shoots do you know where they are. Generally, each root mass sends out several shoots. How many dormant root masses are left after a buckthorn grove has been cut and treated? In some areas at Pleasant Valley Conservancy I have counted dozens. Unfortunately, they all don't come up at once either. In one area where I have been doing intensive work, I am still counting lots even after more than ten years of initial clearing. (And this is an area that has been burned every year.) But we are optimistic that eventually we will exhaust the area. We know already that we are getting ahead of the game. The procedure is basal bark treatment with Garlon 4 in oil. The basal bark technique is ideal since it can be used any time of the year. Our crew is using backpack sprayers for this job. But a hand sprayer can also be used, as the photo here shows. I pull back the stem and give the area at the base one brief "spritz". The red dye helps to control where the herbicide is going. If a few leaves get sprayed, that helps, but the important area is the base of the stem. We have about a two-week window now when even small buckthorn plants will be visible. After that, we'll move on to other things, perhaps prescribed burns! In a recent post I mentioned that Hill's oak (Quercus ellipsoidalis) is easy to identify this time of year because of its distinctive fall color. I should be doing an intensive survey for this species now, but unfortunately can't find the time. However, even from casual observations I am finding new specimens that we had previously classified as black oaks. Yesterday I noticed that there were several small trees with typical Hill's oak color at the top of the ravine west of the woods road. Then, as I drove down the woods road I kept on the lookout for further trees. Sure enough. Almost at the bottom of the hill, right next to the Pocket Prairie, was a tree with the distinctive Hill's color. This tree was large enough that it was in our database, classified incorrectly as a black oak. I pushed my way through the tall Indian grass of the Pocket Prairie to this tree and discovered that it was tree # 1513. Not only was the color distinctive, but the shape was also characteristic of Hill's, including the lower dead branches. Finally, on the ground under the tree were quite a few acorns with the characteristic Hill's structure (ellipsoidal and striped). The accepted common name for this species now seems to be northern pin oak, but I find Hill's more felicitous and lots easier to say. 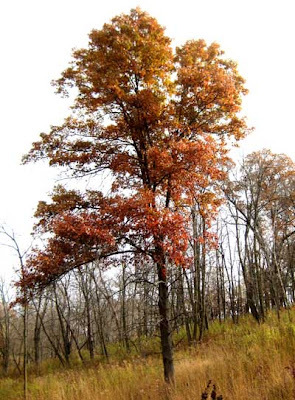 There is another pin oak (Quercus palustris) which is not found in Wisconsin or the upper Midwest but lives in a wide band across the middle of the United States. According to what I have been told by foresters, the word "pin" as part of the common names of these two oaks, comes from the fact that the lower dead branches, sticking straight out, can be thought of as "pins." The tree in this photo is not too far from the outlet from the ravine, and since there is a large patch of Hill's oaks at the top of the ravine, it seems reasonable that acorns might find there way down to the bottom. I used GIS to determine that tree #1513 is about 800 feet from the Hill's oak grove at the top of the hill. Yesterday we conducted a tour for the Berry Backyard Club, a group of local landowners from the Town of Berry (Dane County, Wisconsin). 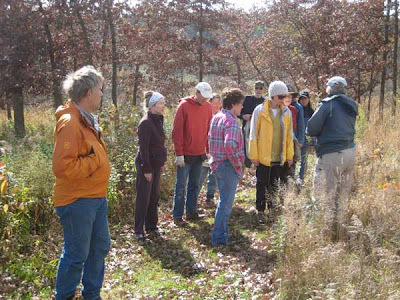 Private landowners play a major role in ecological restoration, and Kathie and I are always happy to offer them tours. In Wisconsin there is vastly more "restorable" land owned privately than owned by government entities. The Town of Berry is similar in many ways to the Town of Vermont, where Pleasant Valley Conservancy is located. Berry is in the Driftless area and is almost exclusively rural in character. According to its web site: "The Town of Berry landscape is defined by steep, wooded hillsides and verdant lowlands. In addition to residential and agricultural attractions, the town boasts Dane County's Festge Park and Indian Lake Park, the Town's Kahl Halfway Prairie Park, as well as several parts of the National Ice Age Trail. Nearly 1200 residents currently inhabit the Town of Berry." Those on the tour had smaller or larger parcels of land which they were restoring or were interested in restoring. 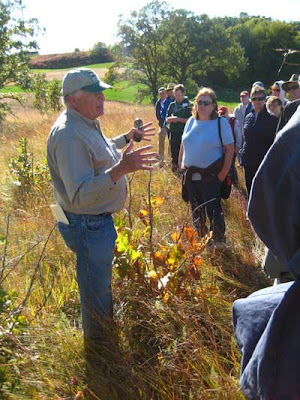 Our tour took them through our prairie and savanna remnants and part of our planted prairies. Lots of really good questions! The weather was a bit breezy but sunny and pleasant. In all, a fine Sunday afternoon. Upland boneset (Eupatorium sessilifolium) is a relatively uncommon species (Special Concern in Wisconsin) that is found primarily in oak savannas or open oak woodlands. Originally we had only a fairly small population at Pleasant Valley Conservancy, but through our restoration efforts and transplants from greenhouse-raised plants, it has now become more widespread. The original population, which had only 5 stems, is now well over 100, and we also have it in at least five other savanna areas. Although we have been able to raise plants, the germination rate from seed is surprisingly low (considerably less than 5%). According to a test I had run at the Seed Lab several years ago, most of the seeds were live but dormant (i.e., tetrazolium-positive). Every year we make an effort to collect a substantial amount of seed, since we have the idea that one of these years the seed viability will be good and we'll get a lot of useful seed. The photo here is from a small prairie remnant in southern Wisconsin which for some reason has a large population of E. sessilifolium. Another species, tall boneset (E. altissimum), is more widespread, but these two species are quite easy to tell apart. The leaf structure on E. sessilifolium is quite different and once you see these two species together, you will never have trouble telling which is which. Finally, there is a wetland species, E. perfoliatum, with the stem perforating the leaf. Again, no trouble telling it apart. Yesterday was our major fall seed-collecting day. The weather was outstanding following a week of outstanding weather. We have been running this event for the past five years. This year we had the biggest turnout ever (19 people at Pleasant Valley Conservancy; 21 at Black Earth Rettenmund Prairie). Some people came for only the morning at PVC, some for only the afternoon at BE, and some came for both. Among others, we had 8 UW-Madison students from the Wildlife Ecology department. They were a great pleasure to have. Lunch was served at noon. Anemone cylindrica Prairie thimbleweed BE Lots! Eryngium yuccifolium Rattlesnake master PVC/BE Lots! Gentiana alba Cream gentian PVC Lots! Kuhnia eupatorioides False boneset BE Lots! Lespedeza capitata Round-headed bush clover PVC Lots! Ratibida pinnata Yellow coneflower PVC/BE Lots! Rosa sp. Rose BE Lots! Schizachyrium scoparium Little bluestem BE Lots! Sorghastrum nutans Indian grass PVC Lots! Yesterday the Conservancy had outstanding color, probably the best I have ever seen; today is equally good. 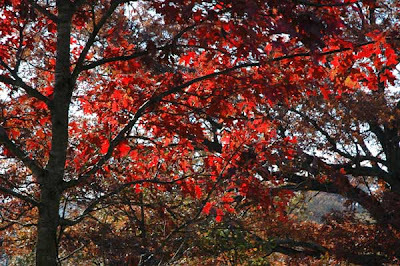 Oaks are not as colorful as maples, but they are often more variegated, with a single tree providing green, yellow, orange, and red. Hard to believe that the red above is from a white oak, since other whites in this same area are dull brown. The color of an individual tree probably depends a lot on age, position in the forest, and health. One species of oak that seems to be consistently colorful is Hill's oak (Quercus ellipsoidalis), and we have quite a few smaller trees of this species. In fact, we had misidentified some of these trees when we constructed our tree database (calling them black oaks), but black oaks are never as colorful as the specimen shown in the photo at left. Hill's oak, also called northern pin oak, is unique to the upper Midwest, and is mainly found on drier sites. According to the information, it occurs primarily on acidic sites, which agrees with our observations, since the pH of the soil near the tree to the left is less than 6. 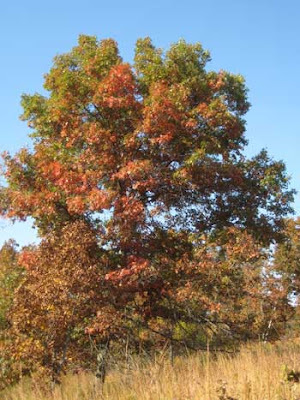 It is a member of the red oak group, which includes oaks with pointed leaves. The species name (ellipsoidalis) was given because the acorns are ellipsoid in shape, and the common name comes from Chicagoan E.J. Hill, who first described this species in 1899 (Hill, E.J. 1899. A New Biennial-Fruited Oak. Botanical Gazette , Vol. 27, 204-208 plus two unnumbered pages of illustrations). 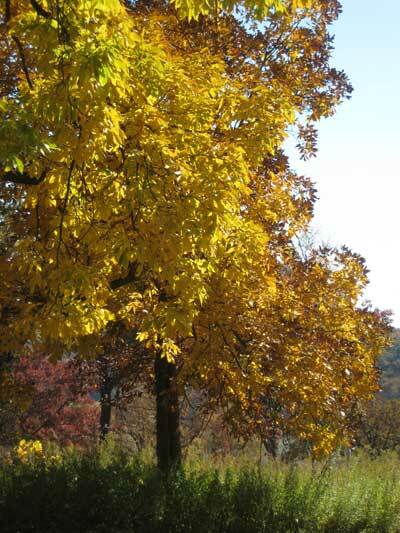 The other tree species that provides a lot of color is shagbark hickory, Carya ovalis, which forms intensely yellow leaves. This species is fairly common in our more open savannas, and provides great contrast with the oaks. Black walnuts (Juglans niger), on the other hand, provide no color at all, since they have already lost their leaves. Another species that provides no interesting color is bur oak (Q. macrocarpa), whose leaves get mostly a dull gray-green. This species also loses its leaves early. They are half gone already and will be gone before the end of October. The unusually warm, dry air is reminiscent of so-called Indian summer, but coming a bit early. According to the National Weather Service, there is an elongated area of relatively high atmospheric pressure over the region, being blocked by a polar trough to the west. If this weather had come a month later it would be ideal for the prescribed burns we are planning for early November. Those who follow these posts know what we think about sumac. Get rid of it! And now that it has turned red, this is the ideal time. Yesterday, all five of us spent the whole day on sumac. Our intrepid crew (Amanda, Marci, and Susan) worked on some unfortunately large clones in Units 6 and 7 and Kathie climbed among the little bluestem on the Pleasant Valley Conservancy road cut. I did clones in the sunnier areas of three savannas. Our technique is simple but effective: basal bark with Garlon 4 in oil. We add a red dye to help keep track of where we have been. 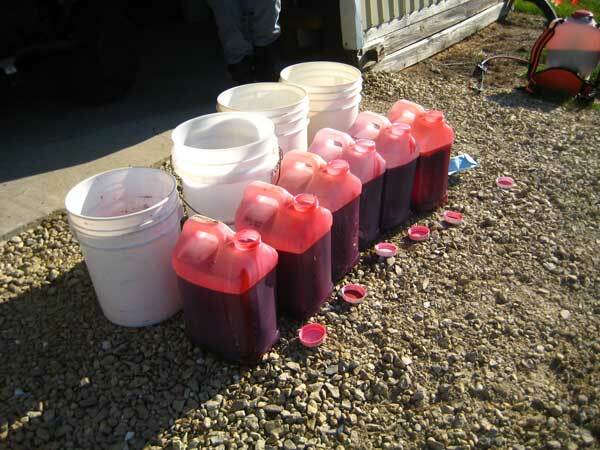 Since most of these sumac clones have lots of stems (100-200 is not unusual), the dye is necessary. Most of our backpack sprayers are Solos, which have proved sturdy and reliable. Experience has taught us that it is essential to have the right spray nozzle to keep from wasting herbicide. The treatment consists of a brief wetting of the lower part of each stem. We have been working on sumac control for the past three years, as time permits. 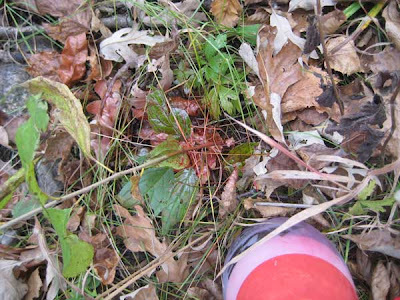 Although our technique is very effective, you don't eradicate sumac with a single treatment, as these clones have impressive underground networks, and root sucker ferociously. Because we top kill our sumac by burning every year, the clones are hard to find nestled down in the tall grass. But now, as is evident in the photo below, the red sumac plants really stand out. Unfortunately, they are also starting to drop their leaves (the unusually warm weather is probably partly responsible), so there is great urgency to get at them now. 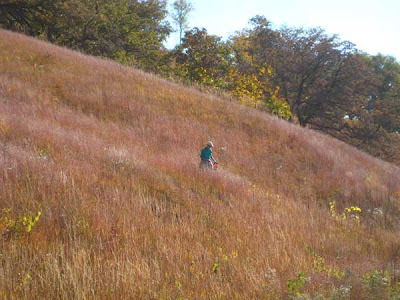 While the crew was working on the tallgrass prairie, Kathie was on another tangent, killing the quite large number of small, scattered plants on the road cut above Pleasant Valley Road. In this dry, rocky environment, sumac plants are fairly short, and clones are rare, but if we are going to eradicate this menace we have to get every plant. Working the road cut involves a lot of hill climbing, since after you climb up to the top of the road cut, we have to climb back down and start over a few yards away. Sumac is a species that grows best in open, sunny areas, so it is less of a problem in our savannas, and no problem at all in the oak woods. Prairie people from here to Nebraska have been dealing with sumac for 100 years. John Weaver, a noted prairie researcher, wrote a paper about sumac in prairies in 1917. Over 75 attendees participated on a fine sunny fall day. Westport Drumlin, a high quality dry prairie with numerous attractive native plants, is most noted because it has the largest population in the state of prairie bush clover (Lespedeza leptostachya). 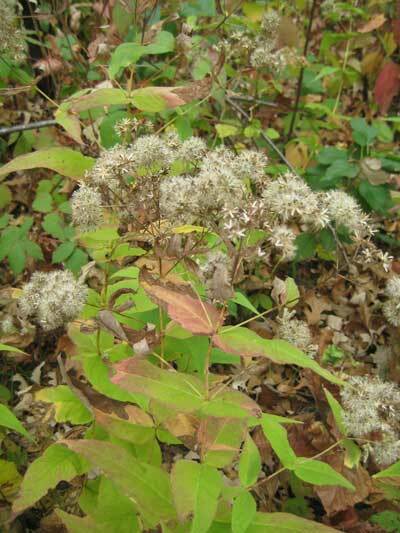 This rarity, a true Midwest endemic, is Federally Threatened and State Endangered. It occurs in only four states, Minnesota, Iowa, Wisconsin, and Illinois (which has only a small population). Other attractive prairie plants here include downy gentian, cream baptisia, lead plant, silky and sky blue aster, and compass plant. A large population of pasque flower is present, and the site is one of the best places in the Madison area to catch sight of this early bloomer. In addition to the prairie, there is a small but potentially fine bur oak savanna at the south end of the drumlin. In addition to the Drumlin, the Koltes remnants are two other prairies here which the Prairie Enthusiasts has been managing for a number of years. Field trips (8 in all) were conducted to various parts of the site. I split my time between two trips, one led by botanist Ted Cochrane and the other led by prairie restorationist Mark Martin. 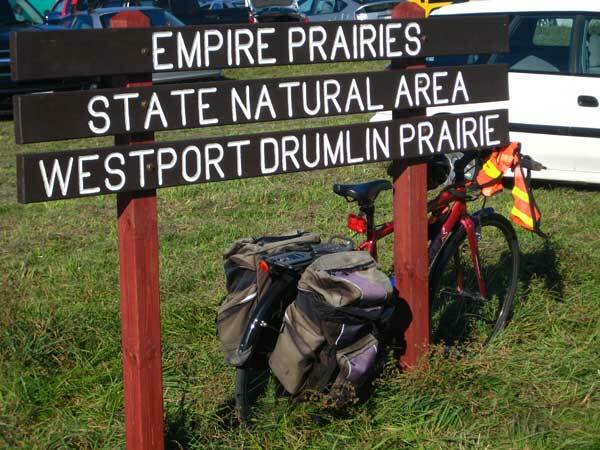 Westport Drumlin has been a State Natural Area and available to the public for many years, but until now access has been by way of an unmarked easement across private cultivated land. Now, with public control of the whole site, a parking area has been established and a trail will be marked to the site. 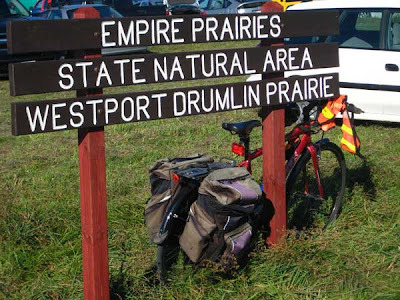 One of the attractions of the Westport Drumlin Prairie is its close proximity to Madison. From the high point it is possible to see not only the State Capitol but also Lake Mendota. It is rare to have such a high-quality prairie so close to Madison. It is also only about a mile from the Waunakee Village limits. The Westport Drumlin is off Bong Road in the Town of Westport, Dane County. From Madison go north on Wisconsin 113. Bong Road is the next right after the traffic light at the River Road intersection. Follow Bong Road to the top of the hill where a sign (see above) marks the parking area. The kiosk is a short way to the north from the parking area. Follow the unmarked but visible trail to the Drumlin (about 1/2 mile north). A search for "Westport Drumlin" on Google Maps should result in a "hit".